Skin protectant. Helps treat and prevent rash associated with diaper use or continued exposure to feces, urine or both. Protects skin from minor irritation associated with diaper dermatitis and exposure to feces and urine, and helps seal out wetness. For external use only. Avoid contact with eyes. Not to be applied over deep or puncture wounds, infections or lacerations. If condition worsens or does not improve within 7 days, consult a doctor. Keep this and all drugs out of the reach of children. In case of accidental ingestion, seek professional assistance or contact a Poison Control Center immediately. 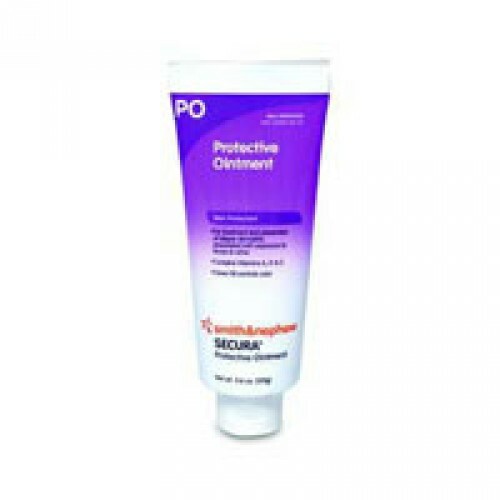 Is the secure protective ointment a white cream or blue gel? The ointment is a white cream color. Excellent Product and Value for your buck! I have used this product for years and have never been disappointed. It soothes the skin and relieves the pain in as little as 12 hours. Not only am impressed with the product--but the service I received from your company was excellent, leaving nothing to be desired. I will definitely be doing business with you in the future. 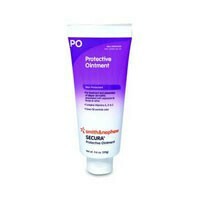 This barrier cream works very well. I am pleased with how it works. Vitality Medical has one of the best prices on this product on the net. Don't be fooled by companies that offer this ointment at an unbelievable low price only to totally stiff you with shipping and handling charges. Vitality Medical offers an excellent price with affordable and fair shipping fees. 8 to 9 hours in her chair 5 days a week while attending a program and in 5 years has not had a serious skin break down. I love this product - don't know what I would do without it. I'm out of luaege here. Too much brain power on display! It was the best cream ever! I always had some rash from my period pad and it got more and more painful. I tried several kinds of cream to treat it but none of them worked for me. But this one was just great. Within a few days, rash was gone away but skin got softer! Just great! I first had experience with this product while in the hospital receiving chemo treatment. I have never used a product that worked so well before. When I got home I was hoping to find it and here it was! Thank you Vitality Medical for having the product I love so much! It took my sons diaper rash away over night!